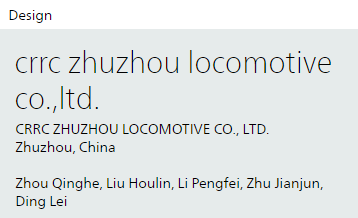 On March 15th, the CRRC ZELC independent industrial design five-modules energy storage tram won the 2019 German IF Design Award. This modern tram is a green, intelligent urban light rail vehicle. Using a hybrid power supply model based on a super capacitor lithium carbonate battery, it can quickly charge when at a stop on the platform in the docking time, so there is no need for overhead power cables, no corrosion of underground pipelines, and excellent adaptability to the local environment. It has a succinct and streamlined appearance, and the interior features a lighting system that imitates blue sky and white clouds creating a spatial ambience that is bright and cheerful. The floating cars and bogies are specially designed to ensure barrier-free access. Founded in 1953, the iF Design Awards are held annually by the iF Industrie Forum Design, Germany's oldest industrial design agency. The IF International Design Forum in Germany is selected annually for the iF Design Award. It is known for its “independent, rigorous and reliable” awards. It aims to raise public awareness of design. Its most important gold award is “product design”. The Oscar Award is called.